There are two stand out features on the Samsung T9000 smart refrigerator. First is the LCD touch screen. The 4 doors are the second thing many notice. The LCD touch screen is the control center for the fridge. Here you can adjust temperatures among many other tasks. The screen can also be used to share photos and recipes with friends and family members. That seems like it would be a less useful feature with smartphones and tablets usually within arm’s reach. The idea is a good one, but probably not the most practical. The 4-doors allow for ultimate customization of how the generous amount of space is used. The top is the refrigerator part with 16.4 cu. ft. of space. The lower right side is a 6.1 cu. ft. freezer. The 6.1 cu. ft. bottom left side is highly adjustable and can be used as either as you need it. This is a great feature that will be extremely helpful to those who entertain often. 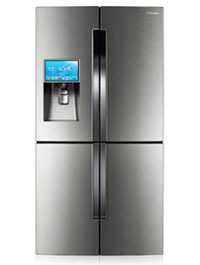 This smart refrigerator from Samsung will be available in the late Spring of 2013 for a suggested retail price of $3,999.99.